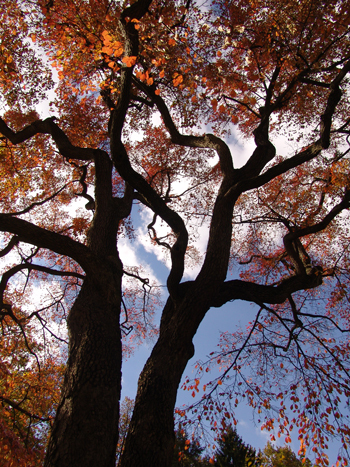 Nyssa sylvatica, the very tree Van Morrison immortalized in Tupelo Honey. I recommend turning on your iPod or turntable to set the mood while we explore this romantic specie. 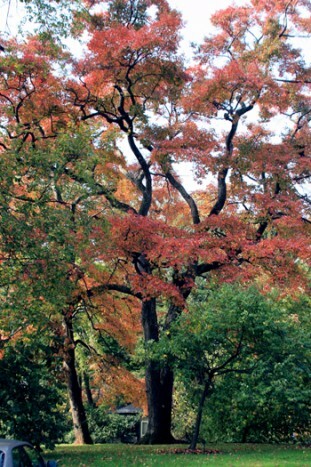 Nyssa sylvatica is a wonderful native North American tree with remarkably wide distribution. It can be found in mixed woodlands from Ontario, south to the border of Mexico, and as far west as Texas. Of course, its extensive range means that it sports many common names. 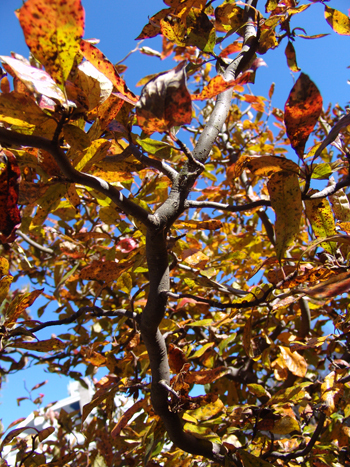 Be on the lookout for trees called tupelo (though tupelo can refer to any tree in the genus Nyssa), black tupelo, black gum, sour gum (though not particularly gummy), beetlebung (nothing to do with insects), and pepperidge. The origins of these colloquial names are fun to research and a good diversion on a cold winter day with a cup of tea at your elbow. If you know of others, put them in the comments section of the blog and tell us about them! But I digress. Of course, you are wondering if Van knew what he was singing about. Well, yes he did. Nyssa sylvatica blooms in spring after the leaves have emerged, producing separate male and female flowers that are a siren call to bees. The flowers are not showy, being only small, greenish clusters borne in the axils of the leaves. The flowers are an abundant source of nectar for insects like bees. Despite this lackluster floral display, it showcases lovely green oval drupes that develop in late summer. These chocolate-covered peanut sized drupes mature to a beautiful dark, dusky blue that is very ornamental and much loved by birds. One caveat: Black gums are primarily dioecious, meaning male and female flowers are borne on separate plants. However, if you are particularly interested in having heavy fruit set to admire and to attract birds, you’ll want a female tree with a male tree within flight distance of the average bee. But here’s the best part: Nyssa sylvatica simply has unrivaled, reliable fall color. 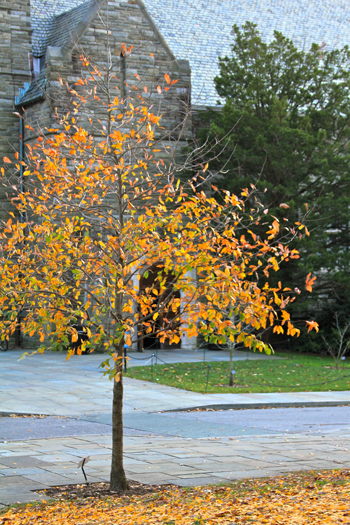 As one of the first trees to start trotting out its fall wardrobe, it sends a clear signal that fall will soon arrive. In September its glossy, leathery, ovate leaves begin to turn sparkling yellow, and then progress through apricot, orange, brilliant red, crimson, and eventually deep maroon. I have seen breathtaking specimens exhibiting their full range of colors all at once; nothing can compare. Now that you have decided you must have one (or several) of these lovely trees, let’s examine some of the nuts and bolts of growing them. 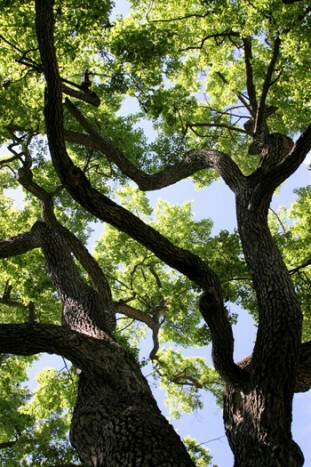 In cultivation, black gums generally reach 30-50’ tall and 20-30’ wide, though a well-sited tree can grow much larger. Pyramidal when young, the branches attach to the straight central trunk at right angles, and circle it all around in a very distinctive way. See for yourself: when you find one (there are several growing along Alice Paul Residence Hall) wrap your arms around the trunk, press your cheek to the bark and look up, you’ll see what I mean. Don’t let the stares of passersby dissuade you from this task; it is important that you understand. For best results, when shopping choose a young, container-grown tree. It will reward you by becoming established more quickly than a large specimen, and with careful watering and good, fertile, acid soil (pH 5.5-6.5) it will soon be settled in and showing off in the fall. 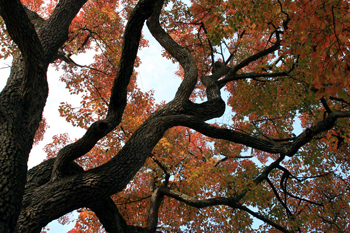 There are several cultivars of Nyssa sylvatica in the trade, three of which can be found on campus. One of the nicest and most readily available is ‘Wildfire’, selected not only for its fall color, but the fact that its new growth in spring emerges red, and maintains a reddish tinge all throughout the summer. Others are Red Rage™ (‘Haymanred’) which is resistant to a leaf spot fungus that can sometimes occur, and ‘Zydeco Twist’ which has slightly contorted, zigzag branches that look interesting in winter. But no matter your choice, if you plant a black gum where you can see it framed through your favorite window you will enjoy its fall display for many years to come. Susan Mintun is a transplanted teacher and horticulturist who moved to Philadelphia in 2011. She served on the faculty and curated the plant collections of the Horticulture Department at Meramec College in St. Louis for many years before her husband’s job brought them back to this area. She holds undergraduate degrees in Fine Art, Business and Horticulture, and a Master’s degree in Plant Science from Washington University in St. Louis. Susan is thrilled to be back in the city where she grew up! She is enjoying rediscovering all the area has to offer and volunteering her time at the Scott Arboretum of Swarthmore College. She has two perfect children, both in college, the world’s best dog, and two spoiled cats. She and her husband, Mark, live in Villanova. This is a fun article and the pictures are among my favorites of tree portraits. Just wish I had thought of planting one years ago!